Wouldn’t it be nice if you could build a report once and be able to re-run it with a couple clicks whenever you want an update of the data? Or even better, have LGL run it for you on a schedule and email you the results (daily, weekly, or monthly)? 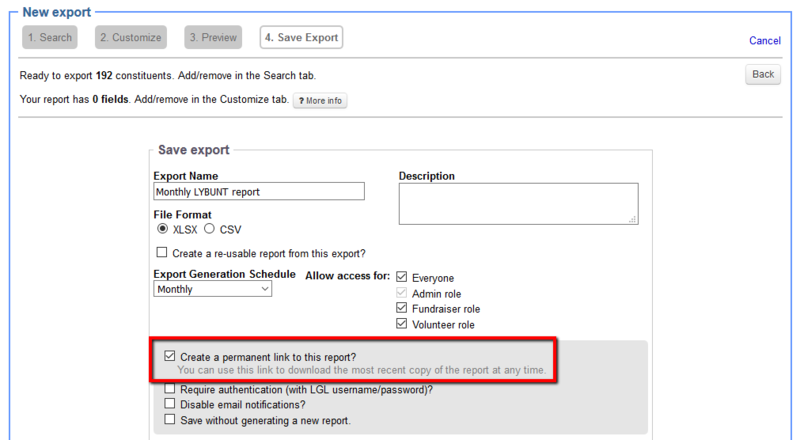 You can do just that with LGL's reporting feature, accessible from the Reports page or from any search results page in LGL. Almost immediately, you'll get access to either a PDF or CSV report you can use to see what's happening with your data or share with others. 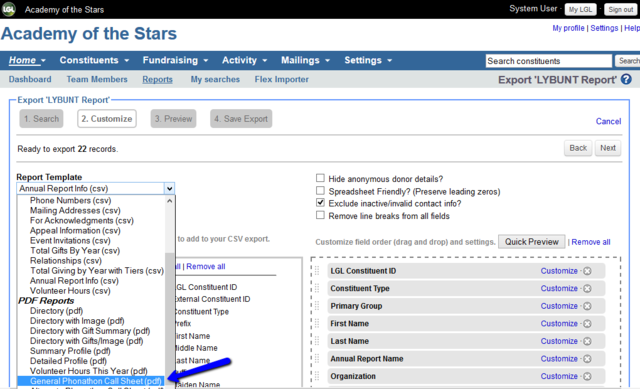 Search for records to pull into your report using the standard Advanced Search functionality from either the Constituents or the Fundraising tab, or you can start from the Reports page using one of the canned reports automatically available in your account (see the "Working with reports and exports" section later in this article). This is where you can tell LGL what fields, or data points, to put in your report. You can choose one of the CSV report templates from the Report Template drop-down menu and either use it as is or update it based on your preferences. You can also choose a PDF report template from the Report Template drop-down menu (note that PDF reports are not customizable). Or you can start fresh from the Customize screen of the report builder, make your selection of fields, and customize them to your needs. 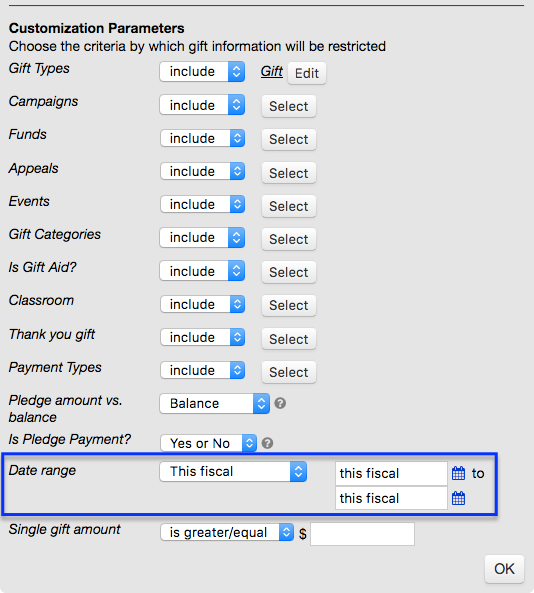 CSV reports are fully customizable—you can add fields, remove fields, rearrange the order of fields, customize field labels, specify a primary or secondary address, choose gift type, and numerous other options. 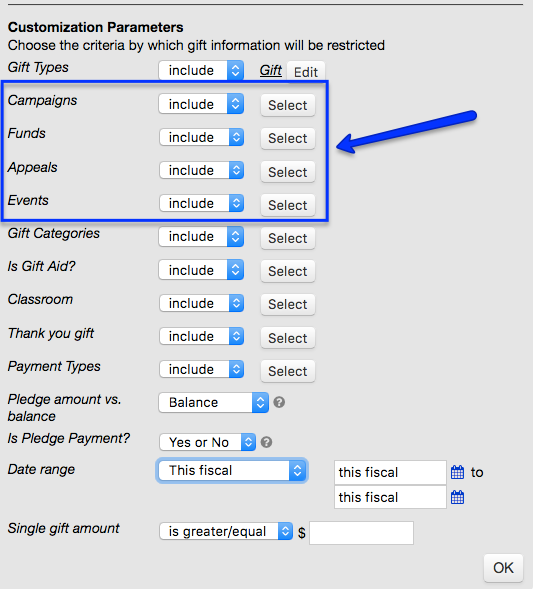 If you click on the Customize link next to a field, such as Total Giving, for example, this is where you further refine what type of information will be presented in the Total Giving column in your report. 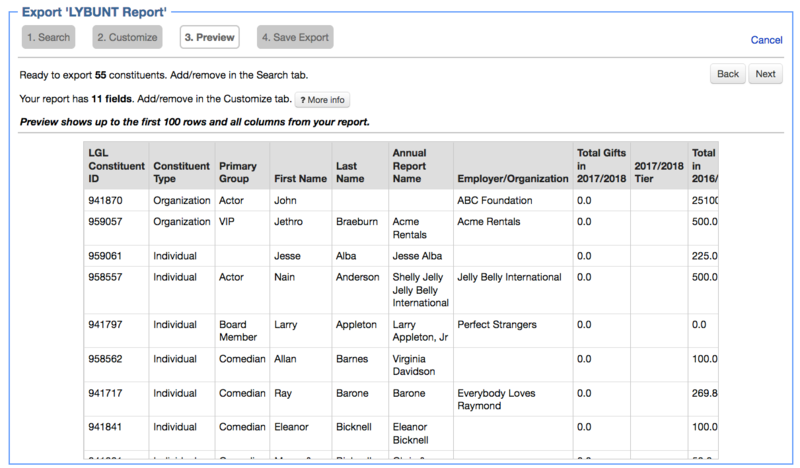 There is no relationship between your search query from Step 1 above and the fields you choose from the Customize screen of the report builder in Step 2. What this means is that once you’ve created your overall search query, you also need to make sure your customizable fields are set to pull the data you want in your report. When you are happy with the report, you can save it as a new canned or reusable report or you can export the results (right away, or on a schedule). 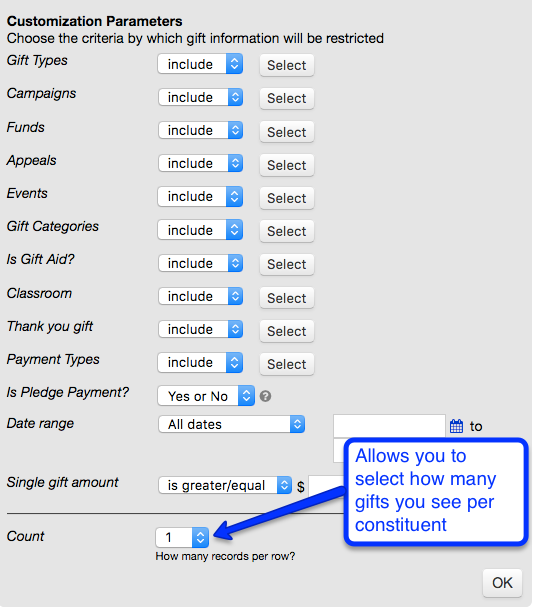 Most of your report management takes place on the Reports tab, where you can review and manage reports and exports for Constituent, Gift & Pledge, Goal, Contact Report, Task, Volunteering, and Note information. 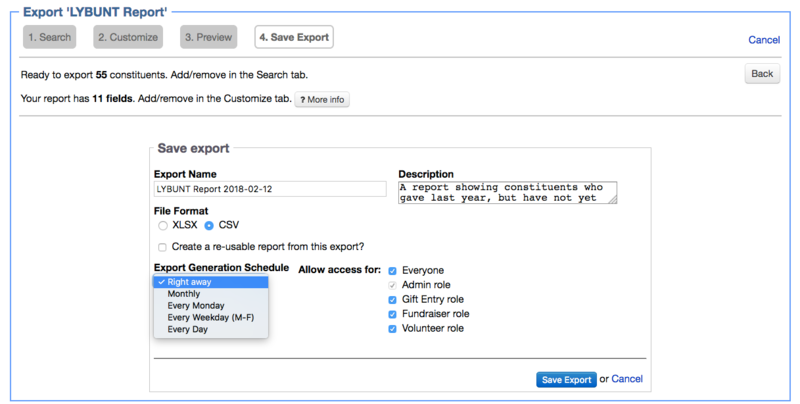 In the 4th step of the report builder, the Save Export screen, select one of the available options from the Export Generation Schedule dropdown menu shown below. Note: Scheduling options include monthly, every Monday, weekdays Monday through Friday, and every day. Make sure you complete the fields tracking other data about your report, such as name, description, and team member roles for those who should have access to the report. 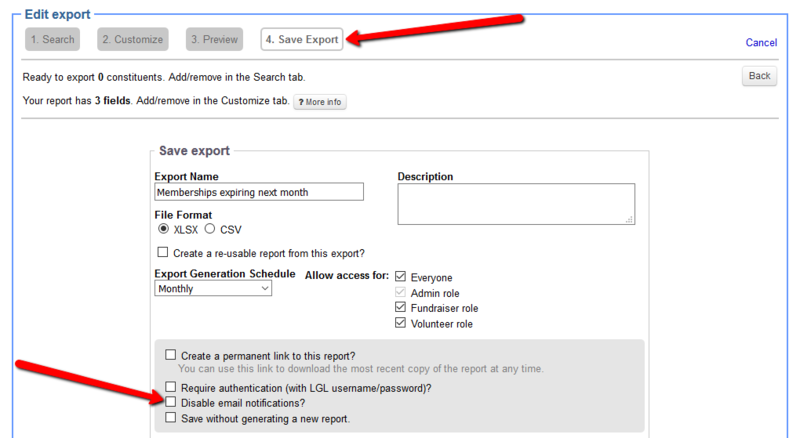 Click the Save Export button to save your export as a scheduled report. 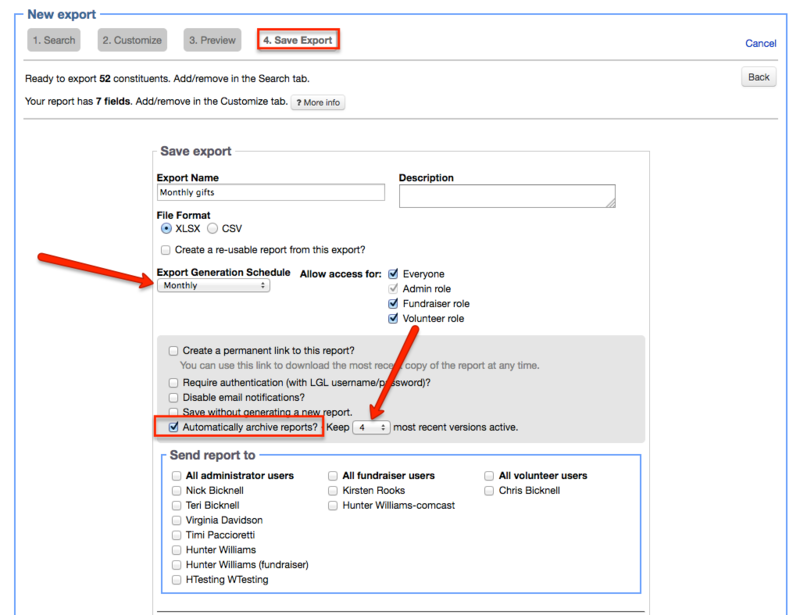 Keep in mind that any reports you have saved as scheduled for automatic generation and email delivery will now be listed in the Scheduled reports tab available from the Reports page. Scheduled reports can also be set to create a "permanent link," which generates a data file at a fixed URL location. The permanent link provides a fixed URL where the data from this report will be stored as a data file. When your report updates every weekday, week, or month, you can pull in that new data very easily, and the location of the data (the permanent link URL) will stay the same. All of your exports (including those from before this release) are available for review and download. 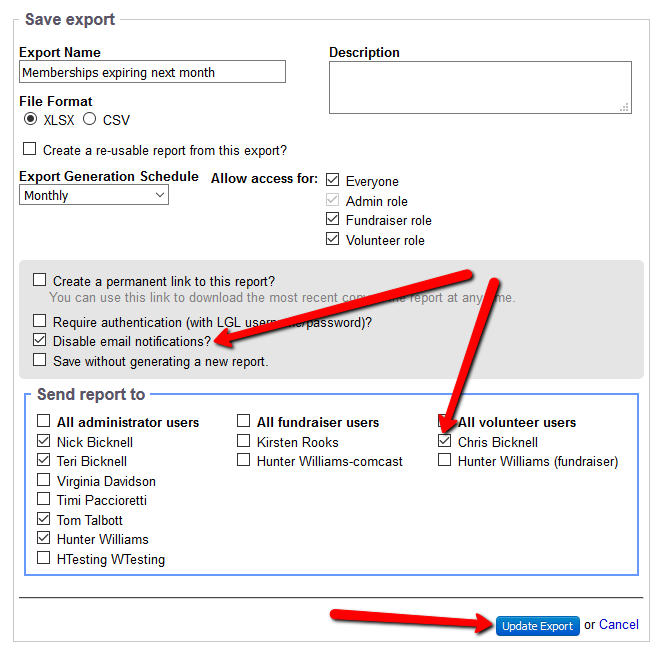 You can also take any previously run export and either re-run it or convert it into either a scheduled report or a saved, canned report.